Jake Crosby's nine-year-old daughter Katy is pure tomboy, and her dad couldn't be happier. Since she was old enough to walk, Katy has shared Jake's love of the outdoors, taking to hunting and fishing as quickly as other kids take to baseball or bike-riding. As he packs the truck for a spring turkey hunt, he vows to savor the time with his little girl. But Jake's hopes for an idyllic weekend are shattered when a band of drug dealers attempts to break into the Crosbys' remote hunting camp. Desperate to protect his daughter, Jake makes a violent and gut-wrenching decision. His quick thinking enables him and Katy to escape the camp and flee into the Noxubee River swamp. The bloodthirsty criminals are hot on their trail, however, and no one, no matter how innocent, will get in the way of their vengeance. As their treacherous game of cat and mouse winds deeper into the wilderness, Jake must face the fact that not everyone will come out of the swamp alive - but he will do whatever is necessary to make sure that Katy does. 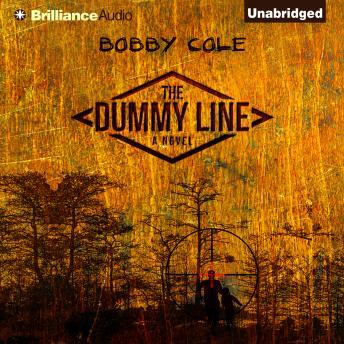 Taut and engrossing, The Dummy Line is the riveting tale of an ordinary man pushed to extraordinary lengths to protect his only child...and those for whom he feels responsible.